CURRENCY AND LEGAL TENDER: The new ’15 class banknotes reflect Sirocco’s 1950s culture, and for the first time include a dollar-simoleon currency conversion on the reverse. Havilland, WE, Nov 4 · Gra 20 – Siroccan wallets and coffers will begin to look very different from next month following today’s reveal of new simoleon banknotes by the Ministry of Finance. The new notes, officially named the “’15 series”, range from the purple §5 to the blue §100, and feature a clean 1950s design that mostly follows the colour scheme of the 2012 banknotes, with the exception of the pink §5 and purple §20 notes, which have been replaced by a red-purple on the §5 note. One notable omission is the §200 note, presently Sirocco’s highest-value banknote. Considered a cumbersome relic like the former §500 note, the §200 note has not been redesigned and will not be replaced in the future. The faces of the banknotes remain mostly the same, however the pending demonetisation of the §200 note means that each of the faces is on a different banknote in the ’15 series to those of the 2012 series. While the 2012 series banknotes used the Akzidenz-Grotesk and Segoe Ui typefaces heavily, the new ’15 notes use the 1950s-styled Filmotype Fashion and Trump Gothic East, with Directors Gothic 250 featuring on the reverse. New to the notes is a currency conversion, which shows the value of the note in New Zealand dollars. 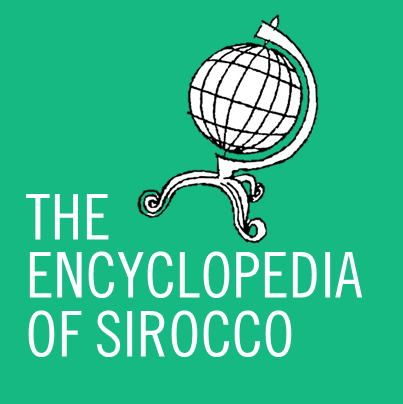 Sirocco’s two official minority languages, Siroccan and Edallic, are both featured on the obverse despite their use waning in the last few years. 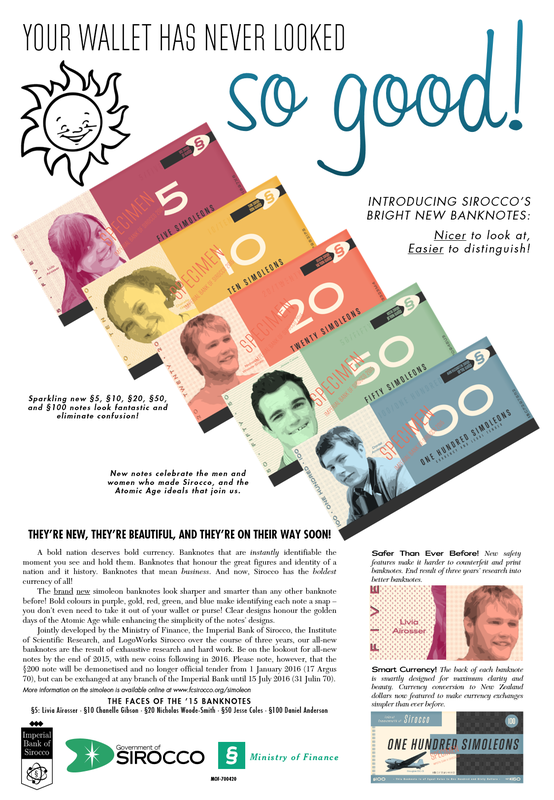 Sirocco’s new banknotes were unveiled in an advertisement from the Ministry of Finance today. In a printed advertisement displaying the new notes, the Ministry said that the notes are clearer and will eliminate confusion between notes. A spokesman for the Imperial Bank of Sirocco (IBS) said that one major goal of the redesign was to make each note clear and distinct from the others in a wallet or purse without needing to draw the note out to examine it. Unique patterning and gradients in the notes’ design will serve as security for the notes alongside the identification codes on the obverse. The new notes were jointly developed by the Ministry of Finance, the IBS, the Institute of Scientific Research, and LogoWorks Sirocco over a period of three years. Intended to slightly update the notes for 2013, the consortium was unable to decide upon a design until a few months ago, when typeface research into the Directors Gothic typefaces introduced sample designs that went on to heavily influence the new banknotes. The banknotes will come into circulation in early December, with the old banknotes demonetised on 1 January 2016 (17 Argus 70). Those with old notes still left after the change will be able to exchange them for new notes at IBS branches until 15 July 2016 (31 Julin 70). New coinage is to follow in early 2016, the first to be based on the simoleon-shilling-baud format that was introduced in February 2014. As was the case with the 2012 notes, collectors will need to source a special “collector’s series” of notes from the IBS. Who’s on the ’15 simoleons?